Isabelle Grace Jewelry stackable gemstone bangles. Photo courtesy of Hollywood Connections PR. October is the heart of fall. The leaves are finally changing, and so is your nail color. Flirty dresses and sandals are replaced with sweaters, jeans, and boots. Pastels and bright colors are relegated to the back of your closet, while deep plum, navy blue, and military green take center stage. If you’re still looking for the perfect fall accessory for your next date night, consider Isabelle Grace Jewelry’s stackable gemstone bracelets, which come in five shades to complement any fall look. Check out our product review below! Isabelle Grace Jewelry stackable gemstone bangles are 8mm Swarovski chatons, hand set into a silver- or gold-plated bracelet. With a stone size of about 1.5 carats, the bracelets are available in burgundy, metallic blue, khaki, silver night, and white opal. These adjustable bands will add an extra bit of sparkle to your next night out. You can wear one on its own, layer them together, or even stack them with other bracelets. The options are endless! It’s easy to see why ladies adore them: They’re unique yet timeless. They’re a statement piece, but the simplicity of the design makes them perfect to wear anytime. Isabelle Grace Jewelry carefully crafts their products from the best materials and by people who truly love creating beautiful things that never go out of style. If you want to impress your man on your next date night, add these stackable bangles to your outfit for a chic and elegant look. Be prepared for an endless amount of compliments from your sweetheart! 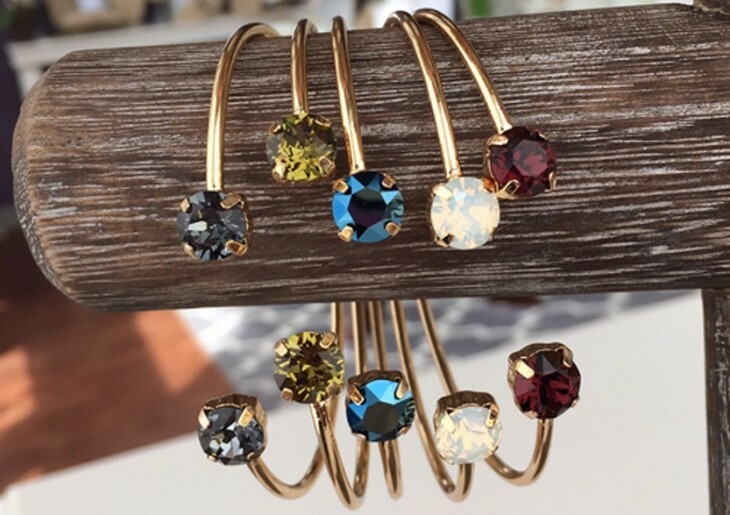 GIVEAWAY ALERT: One lucky reader will receive an Isabelle Grace Jewelry stackable gemstone bangle in the color of their choice to spice up their date night look this fall! To enter our giveaway, complete the form on our Contact Page BEFORE 5 p.m. EST on Monday, October 19th. Pick “Giveaways” in the dropdown menu and include your name and address as well as “Isabelle Grace Jewelry” in the message field. You may enter the contest only once. Good luck!